The artwork for last year’s Malta Book Festival by Julinu. 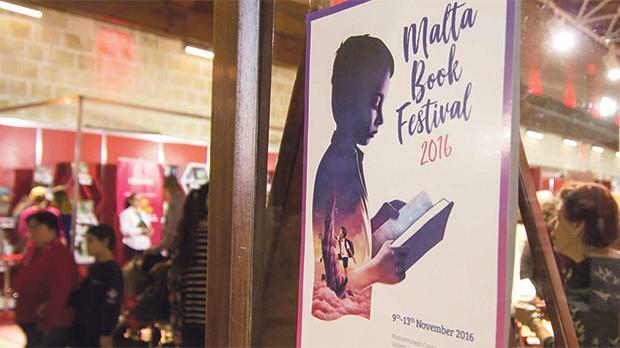 Since the Malta Book Fair was re-designated as the Malta Book Festival in 2013, each edition of the festival has been characterised by a theme chosen for its relevance to the current socio-political environment. This year’s edition is no exception, as the festival opens on November 8 with a conference on ‘Truth in Fiction and Non-Fiction’. Most of this year’s guests will participate in the conference – local author Alex Vella Gera; Kuwaiti poet, academic and writer Shahd Alshammari; French novelist Gilbert Sinoué; and British poet and writer Ros Barber. The talk will be moderated by former BBC journalist Rosie Goldsmith. The conference will take its lead from the question of how to define truth in literature, from the equation of equivalence that identifies truth as fact in non-fiction to the implicit difficulties of finding an equivalent formula in other genres. The problem is compounded further by the emergence of new genres which tend to straddle the line between fictional narratives and factual reporting. One instance of this is literary journalism, a genre made popular by publications such as Roberto Saviano’s Zero Zero Zero or Samar Yazbek’s The Crossing: My Journey into the Shattered Heart of Syria. While there is no reason to doubt the veracity of these accounts, how does one weigh the element of the truth in a literary text infused with figures of speech, including extensive use of metaphors or just plain exaggeration? One of the participants in the conference, Ros Barber, gives another instance of this difficulty with her book The Marlowe Papers, a novel in verse that tells the story of Christopher Marlowe as the real William Shakespeare, based on a hypothesis known as the Marlovian Theory of Shakespeare Authorship. The hypothesis itself has been discredited but that is, perhaps, besides the point. The question is: what happens to the notion of the truth once the simple equation of truth-equals-fact breaks down? Should we abandon the concept of truth in fiction as being an intractable concept? Members of the public are invited to join Barber, Vella Gera, Alshammari and Gilbert Sinoué, along with Goldsmith, to rack their brains on this hard question on November 8 at Sir Temi Zammit Hall at the Mediterranean Conference Centre at 8pm. Participation in the form of questions from the audience is both expected and encouraged.